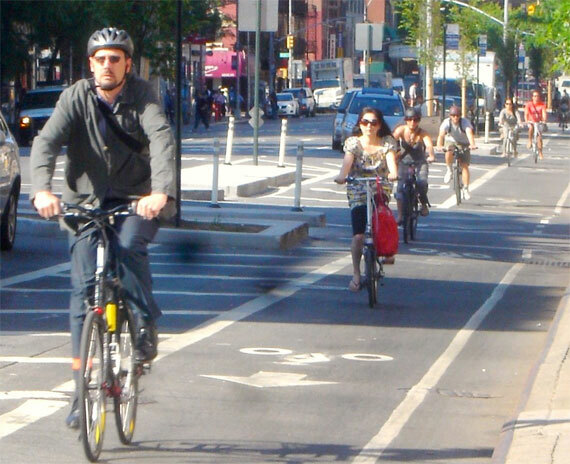 If bicyclists want to convince policymakers of the benefits of cycling, they need to stop talking about cycling. That was one major lesson of this year’s National Bike Summit, thanks to some strategic research done by a friendly consultant. So the Summit’s theme was “Bicycling Means Business” – and the economic impacts of a healthy cycling culture don’t end with the cyclist. “Bicycling is a good investment, not just for cyclists, but for the entire city, state and region,” said the Bike League’s Darren Flusche at a morning panel of the Summit. He warned activists against showing up to a lawmaker’s office and spewing data without the personal narratives that really get people’s attention. But data is important to back up that personal testimony – and here’s the data. As Janette Sadik-Khan told the Women’s Bike Forum, businesses on Eighth and Ninth Avenues in New York saw a 50 percent increase in sales receipts after protected bike lanes were installed on the corridor. On San Francisco’s Valencia Street, two-thirds of the merchants said bike lanes had been good for business. If a business has a bike-share station out front, bike-share users are more likely to patronize it. Chuck Marohn of Strong Towns told the story of a Memphis neighborhood where people, without authorization, spent $500 on paint and made their own bike lanes. Six months later, commercial rents on the strip had doubled, and all the storefronts – half of which had been vacant – were full. Businesses in some cities are also beginning to see the spatial logic of the bicycle. After all, 12 bikes fit in one car parking space. Providing bike parking is also an extraordinary bargain compared to building structured parking: one parking space in a garage costs at least $15,000 to build and hundreds of dollars per year to maintain, while building a rack for two bikes costs $150 to $300. Another famous example of the cost-effectiveness of bicycling and walking investments: Portland built its entire bicycle network, up until 2008, for the cost of one mile of urban four-lane freeway. Put another way: the entire federal allocation for the Transportation Alternatives program – which underwrites active transportation projects and much more – would pay for just 10 or 20 miles of highway. Plus, building a freeway means spending a ton of money on materials. Bike facility construction generally has a much better ratio of labor to materials, meaning that bike facilities create more jobs per dollar than new roads. Those new bike facilities aren’t just good for the bottom line of adjacent businesses – they’re also good for nearby property owners, who see their property values rise. 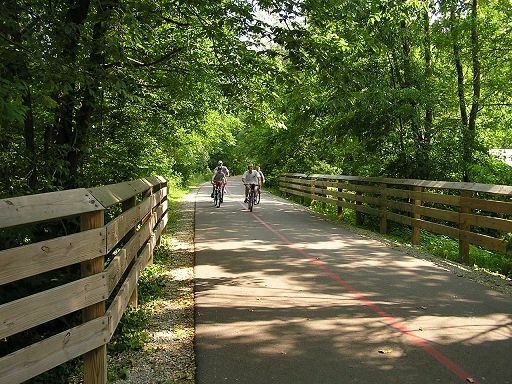 A home near Indianapolis’ Monon trail is worth 11 percent more than a home a half mile away, Flusche noted. Each WalkScore point is worth $700 to $3,000 in the price of a house. Streets that accommodate all users — including cyclists, pedestrians, and transit riders — mean less traffic congestion and better quality of life. Not surprisingly, then, they are also linked to higher commercial property values and lower vacancy rates, according to Marohn. Add to this the simplest calculation of all: car costs saved. The IRS estimates the cost of driving to be 56.5 cents per mile. AAA estimates the average annual cost of car ownership to be near $9,000. Energy regulation expert Ken Colburn — also a cycling instructor with the Bike-Walk Allinace of New Hampshire — said the top reason for mortgage disapproval is that people’s car payments are too high, making them a bad credit risk. “The probability of foreclosure increases with car ownership,” he said. Convinced? Go tell it to your Congressmember. Pedestrian and transit-oriented cities that did not lose their economic vitality completely back in the mass suburbanization era are booming. The problem is there isn’t enough of them, and people are being priced out. No one is reporting this, but revised data for 2012 show that NYC’s private wage and salary employment has FINALLY surpassed the level of 1969. I’ve been following this for decades, and we’ve never made it. The data was made available yesterday, but this fact was not in the press release so the MSM didn’t report it. Perhaps they are waiting for a big announcement. This doesn’t even count the self-employed. I checked out data from the BEA, and in 2011 there were more than 1 million self-employed “proprietors” in New York City. I was stunned. I think the ratio of bikes:cars that can be parked in a given amount of space is even higher than that. Besides the obvious direct size difference, you can also easily and cheaply use bi-level racks for bikes (they’re very, very, common around here), which doubles the number of spaces, and a bike parking area also requires much less “ancillary” space (access lanes and ramps etc). Because bikes are so much lighter, the resulting structures (for multi-level and underground/elevated parking areas) can also be much lighter and less “architectural” space is needed. The size difference, especially for access lanes, means that bike parking can also often be accommodated in “awkward” leftover nooks and crannies that couldn’t ever be used for car-parking, and are often not particularly useful for anything else. Bike parking can be amazingly dense and fits amazingly well into the urban environment in a way that car parking probably never will (though with things like robo-car-parks, they’re trying…). Come to It’s A Grind 1800 Polk Street 6:30PM March 18 and talk to concerned businesses. They’re concerned that car parking space removal to make way for bike lanes will cost them business. It’s a legitimate concern but the good news is the body of data that now shows the business benefits of bike lanes. Really? Please provide the name and location of the neighborhood, and evidence to support the claim that rents have doubled. You *did* substantiate this, didn’t you? Or don’t journalist standards apply to bloggers. They did a little more than just put in bike lanes, but not much. And it was a very specific, neglect neighborhood — won’t work like that everywhere. Yet, the larger point stands. Walking and biking infrastructure is the highest returning investment we can make today, dollar for dollar. We can make these investments very cheaply (low cost/low risk) and get many more dollars back while also improving people’s lives. Governments have been so obsessive about pursuing the big project that we’ve overlooked the small things that need to be done to make cities work. Focus on those small things and the returns are enormous. Bike-Walk Allinace (Alliance) of New Hampshire spelt wrong. Nice article you put up here, Tanya! I think that riding a bike is the best kind of transport. I recently got my newest bike from this place: http://www.bikeberry.com/ and I highly recommend it. You Know Bicycling Is Good for Your City. Now Prove It to the Skeptics.